It has an extraordinary flavor of artichoke and green hazelnut. Its slight bitterness and its pungent and spicy turn is very characteristic. 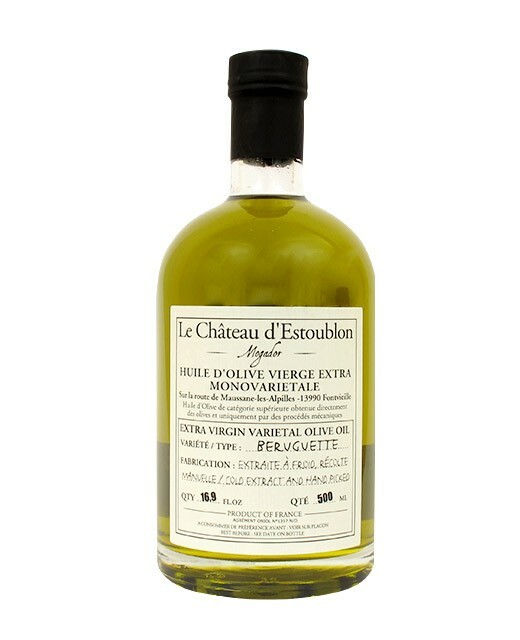 It is recommended for tomatoes and pissaladières and is used very well to braising fish, cooked poultry, leeks, spices and cakes. It also gives a lot of flavor to cakes. 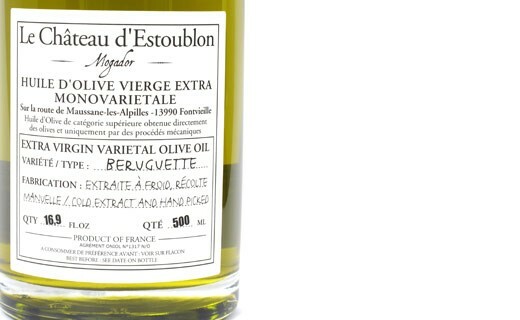 The history of Estoublon is tied in with the history of the Provence region. Its destiny has been in the hands of the Schneider family since 1999. It is now managed by Valérie, Ernest Schneider's daughter and her husband Rémy Reboul. Standing next to Fontvieille, on the southern side of the Alpilles, Estoublon spreads on 196 hectares composed of 70 hectares of olive trees and 21 hectares of vineyard. The olive trees orchard and the vineyard are by the way classified in Protected Designation of Origin Vallée des Baux de Provence since 1995. The harvest is made by hand. The pickers pick the olives with an olive comb that they run in the branches so that the olives fall into a net set up on the ground. This net protects the olives from any contact with the soil, avoiding this way any damage and therefore oxidization.